Sometimes the weather doesn’t cooperate with our best laid plans. If you find yourself rained out or snowed in, rest assured that your time in Gatlinburg, Pigeon Forge, and Sevierville can still be a blast! We’ve rounded up five fun-filled indoor activities that are sure to save the day. Guinness World Records Museum—Opening in late March after renovating, the museum offers hundreds of exhibits that will have everyone in your group wondering, “how did they do that?” Come and peruse unique memorabilia from stars like Elvis, The Beatles and Michael Jackson. For those looking to achieve their own notoriety, you can even try to set a world record of your own! As a bonus, if you planned on visiting Ripley’s Aquarium of the Smokies (another great indoor attraction), you can get a combo ticket. Nantahala Outdoor Center (NOC) – Outdoor Superstore—How about a little challenge and adventure with your shopping? NOC has it all in their 18,000 square foot property. Challenge your friends to the top of their 25-foot indoor climbing wall! If you have kids, the adventure begins with a bear cave for your “cubs”—complete with natural murals—and a swinging rope bridge they will love to cross. If huddling around a fire sounds more appealing, you’ll find a large fireplace in front of the store where you can also learn about gear. Speaking of gear, they have 1,000 square feet of North Face equipment, footwear, outerwear, and apparel. Forbidden Caverns—Did you know Tennessee has the most caves in the USA? While you’re visiting the Smokies, take a trip underground and feast your eyes on beauty and history. Marvel at the natural chimneys, grottos, and streams, highlighted with special lighting and sound presentations. The average guided tour is just under an hour, and there is free parking and a souvenir shop. While you can’t visit in January, they do open in April (through November) so it’s perfect if you find yourself rained out from other activities in the spring. Just keep in mind they are closed on Sundays. Flyaway Indoor Skydiving—America’s first vertical wind tunnel can offer you a heart-pounding experience that isn’t as death-defying as the real thing. You’ll have a 20-minute training class, 15 minutes of gear prep, and then a flight session with five other flyers. Kids can do it too! They only need to meet the weight requirement of at least 40lbs and be mature enough to pay attention to and follow instructions. If you want to wait in the wings while the rest of your party goes weightless, you can watch for free in the observation deck. They are closed on Wednesdays. Cooters—This place has indoor fun written all over it! Visit the headquarters of Hazzard Nation—the center of all things Dukes of Hazzard. 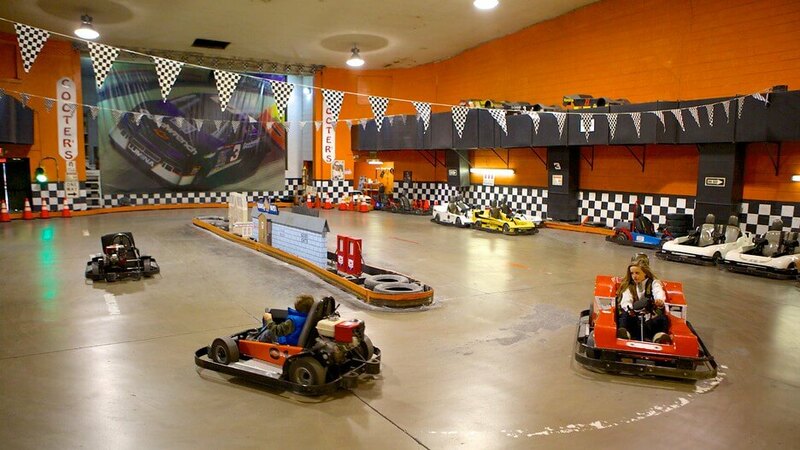 They have an indoor 18-hole miniature golf course and indoor go-karts! There are a variety of cars available to drive for ages five and up. Kids who are three years old and at least 36 inches tall can ride in an adult car. Combo packages for five people are available, which include go-karts, mini-golf, and a picture. If you’re looking for some memorabilia, be sure to visit the souvenir shop too.